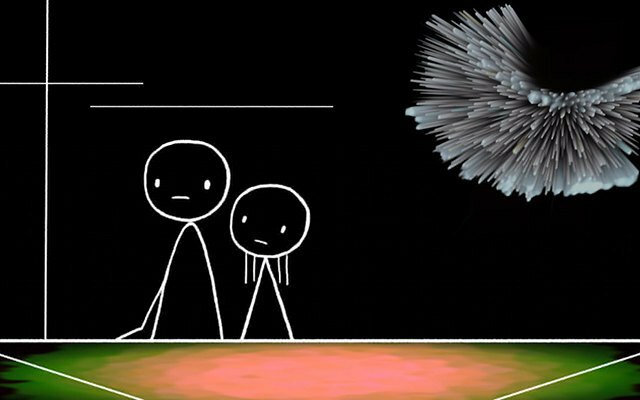 don hertzfeldt's World of Tomorrow – where "a little girl is taken on a mind-bending tour of the distant future" – was just awarded the Short Film Grand Jury Prize at the Sundance Film Festival. “There are more big ideas packed into this 16-minute film than there are in most major studios’ entire catalog of science fiction,” Dan Schindel wrote at the Movie Mezzanine. In World of Tomorrow, the animator auteur (and the director, screenwriter, producer, cinematographer, editor, animator and sound editor of the winning short) embraces digital filmmaking techniques for the first time. His darkly-humored oeuvre previously grew to devastating heights with It’s Such a Beautiful Day, a three-part feature about a man slowly immersed into mental illness. But perhaps the best primer for the uninitiated is his mainstream moment – The Simpsons' most surreal sci-fi couch gag.